PITTSBURGH (KDKA) — Something new has arrived in Pittsburgh, just in time to warm people up. 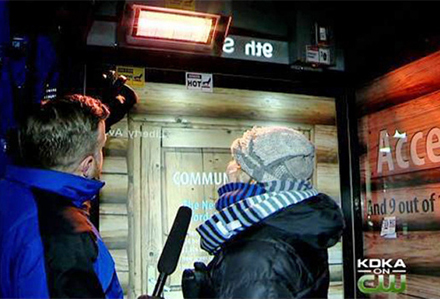 There are now four warming stations: bus stops with heaters for people waiting in the cold for a bus. The stops are equipped with a heater that turns on with a button you push. They have also a motion detector which can trigger the heater. The warmth is courtesy of Highmark Community Blue. There are four stations right now. Three of them Downtown: the Boulevard of the Allies and Stanwix, Liberty and Ninth, and Fifth and Ross. The remaining station is on the North Side near the Rivers Casino. 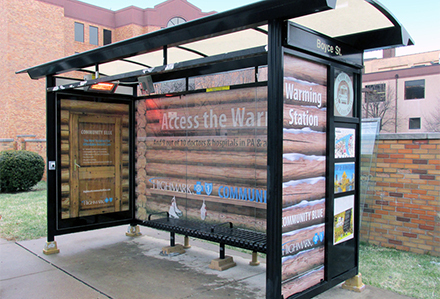 Lamar Advertising transformed bus shelters into warming stations for Highmark in Pittsburgh, PA.
Michelle Pace of the Hill District, who had been waiting 35 minutes for her bus, gave the station a rave review. The warming stations just became operational in the last two weeks. The Port Authority of Allegheny County wasn’t really involved, according to a spokesperson. Instead, it was Lamar Advertising and Highmark. It’s possible that there could be more warming station locations in the future. The original article appeared on CBS Pittsburgh.